The cries travel from the gates of 116th and Broadway to the Morningside campus. It’s a Monday when graduate students strike in protest of the University’s decision to appeal the recent National Labor Relations Board ruling that allowed them the right to unionize. The banging of plastic buckets bolsters the chants as the group marches around Low Library. Members of the crowd point at Low Library. For many undergraduates walking to and from class, familiar faces may dot the hundreds who make up the picket lines—these are the graduate students who teach their discussion sections and Core classes, as well as the secretaries and support staff who march today in solidarity. Classes are canceled or moved off campus. Many unionized support staff leave their desks and stations to strike. The strike is both physically and logistically difficult to ignore. This scene likely feels familiar, considering the strike which took place this past April, organized by the Graduate Workers of Columbia. Like today, a newly conservative NLRB poses a threat to the union’s future, and graduate students on campus are caught in a strange limbo between one court decision and another. The University objects to unionization, arguing that graduate students are primarily students, not workers to be negotiated with. But this morning takes place over 16 years ago, the effort of Graduate Student Employees United. Looking back on the their years of struggle, the GWC hopes to bring about a different outcome. 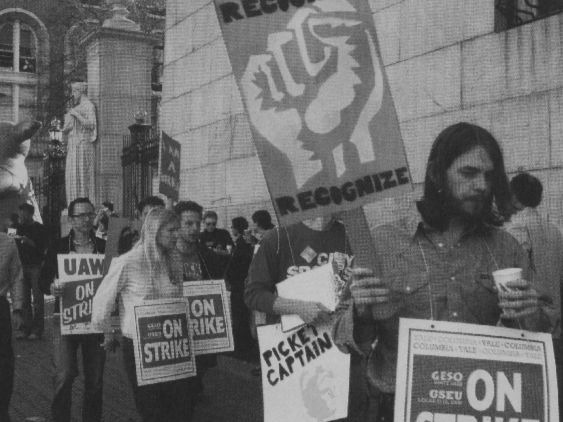 The GSEU was formed back in the fall of 2000 by around half a dozen graduate students in the history department, who were inspired by the NLRB decision earlier that year that granted graduate teaching and research assistants at NYU the right to form a union. The group partnered with the United Automobile Workers Local 2110, the same union which currently represents the GWC and which has represented the clerical support staff on campus since 1985. GSEU strike begins with a walkout. One of these six or so history students was Erik Goldner, eager, optimistic, and in the early years of his Ph.D. program. Unionization seemed simple, obvious even, to him. If it could happen at NYU, then why not here? He laughs as he remembers this. Almost 20 years later, he realizes this simple, obvious thing still hasn’t happened. To Goldner and to other members of the GSEU, unionization meant a voice in their workplace. It was a democratic means by which they could collectively bargain for, among other things, better health benefits, child care, and stipends. With a few pointers from the UAW, Goldner and the others began the footwork of the movement. Felicity Palmer, a fellow student organizer in the GSEU, describes this organizing as having a “rhythm” to it. They camped out in hallways, striking up conversations with teaching assistants as they left their classes. It was a genuine effort to meet people where they were, with a goal of gauging support for the union. It worked. Organizing in this way resulted in a certain solidarity among graduate students across the University. Bonds began to form as students in the English or history departments, for example, found students in anthropology facing the same issues and challenges. Bonds that might never have formed otherwise. During late nights, after days stocked with classes and assignments, Palmer made her way to the top floors of Schermerhorn or Philosophy Hall. There, in the company of 15 to 40 of her fellow organizers, she would pack into an empty classroom and watch as it came to life just as the rest of the Morningside campus was winding down for the night. The sense of optimism in the room grew with each update shared. In those early days, Palmer didn’t expect the marathon that was to follow. Coming from Australia, where graduate student workers were already unionized, she figured the campaign would last maybe two years. Goldner, even more optimistic, saw the campaign lasting only another few months followed by negotiations. “I had no idea it would still be going on almost two decades later,” he admits. Columbia’s stance on unionization has remained largely unchanged over those 20 years—graduate students, the University has argued, are students, not workers to be bargained with. In response to an inquiry from Spectator regarding the decades-long conflict over unionization of graduate students, a University spokesperson pointed to Columbia’s long history of working with other unions on campus. When the GSEU felt confident in union support among graduate teaching and research assistants, it began pushing for an election. 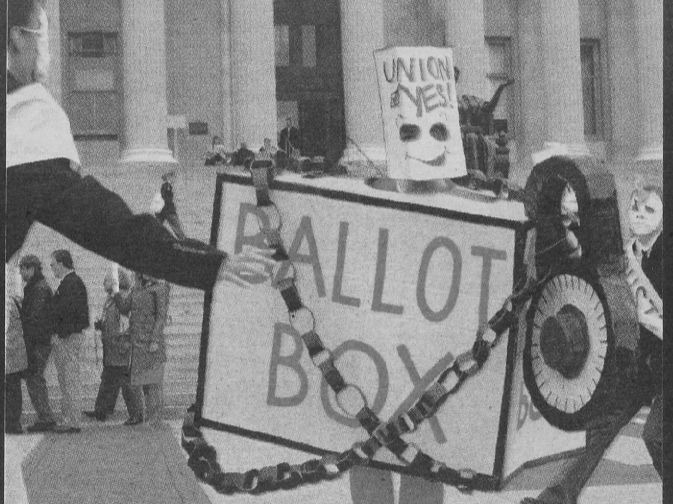 Columbia pushed back in the courts to prevent the election and after a near year-long legal battle, in February 2002, the NLRB ruled in favor of the GSEU. A month later, the GSEU was finally able to take a vote on whether or not to join the union. But before the votes were counted, Columbia appealed the NLRB decision, delaying the results. It was then that talks of a strike first began, a strike to demand the votes be counted. Less than a year later, GSEU members flooded across Low Plaza, bearing blue and white “Union Now” signs in continued protest of the University’s appeal. A “free the ballot box” rally ensued as the community held its breath in anticipation of the NLRB’s decision. Another year passed. Waiting for a decision on the appeal, the GSEU approached graduate students individually to ask for union support. Over two semesters, they gathered enough signed union authorization cards to show a majority of graduate students supported the union. In September 2004, however, the NLRB ruled that Brown students couldn’t unionize, denying them employee status and defining their relationship with their university as primarily educational. The ruling was split along partisan lines, with the three Bush-appointed members of the board voting to overturn the NYU precedent, and the two appointed under Clinton upholding it. The Brown decision went on to serve as the precedent for more than a decade. The GSEU struggled to continue the fight in the wake of the decision. Although the ruling didn’t stop Columbia from voluntarily recognizing the union, it did remove any legal pressure to do so. 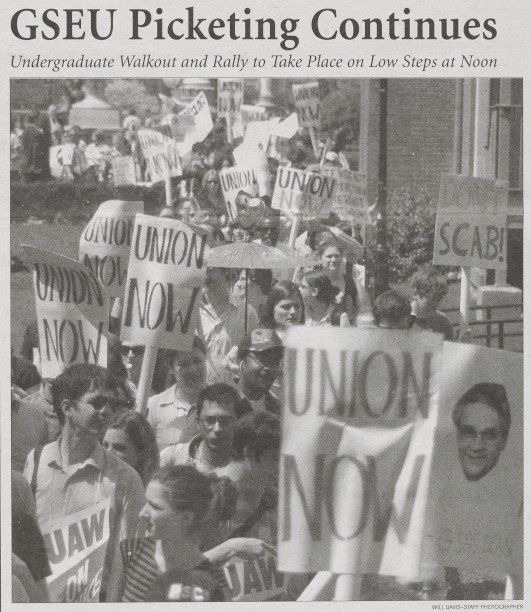 In April 2005, the GSEU held a week-long strike demanding that the University recognize its right to unionize. At the end of the strike, the administration was still unwilling to negotiate. The campaign continued for a short time after, but later that year, when the union contract at NYU expired and then-President John Sexton withdrew recognition, the UAW was forced to divert its efforts to winning back the contract there. Over time, the union effort at Columbia fizzled and faded from campus. Reminiscing on his time at Columbia and with the GSEU, Goldner struggles to understand exactly who at Columbia was responsible for its hard anti-unionization stance and how the University could stick by its argument of principles when doing so meant alienating a whole generation of graduate students. His voice grows strained, seeped in frustration, as he asks me again and again. Over a decade after he graduated, Goldner is still searching for answers. Following the precedent set by the Brown decision, graduate student workers at Columbia lost their right to collective bargaining. The votes were never counted. On February 2 of this year, during a Senate Plenary meeting, Andrew Boyd, an MFA student in the School of the Arts, pulls discussion away from a resolution concerning the principle of academic freedom to demand answers from University President Lee Bollinger. He argues that graduate students perform essential tasks like teaching classes, grading papers, helping with lab work, and writing grants. “Why does that work not qualify us to be considered workers?” Boyd asks Bollinger. Boyd refers to the several rounds of objections that the University filed regarding the graduate student union election, which went 1,602 to 623 in favor of unionization. The principle of which he speaks has remained constant for the past 18 years: Graduate students are not employees. This distinction is imperative. The Bollinger administration denies that this is a union issue. Columbia's legal counsel argues against graduate student unionization in front of the NLRB. "I feel like I have a a responsibility as a professor, as a member of a community, to you as my student,” Bollinger said in a 2015 interview with Spectator. For him, the term “employee” complicates the way he thinks about his students. These studies draw data from public universities at which graduate students have been guaranteed the right to collective bargaining under state laws. In a website put out by the Office of the Provost regarding Columbia’s stance on graduate student worker unionization, the University has argued that the situation at private institutions is different because public universities are protected against unions by state labor laws, which typically prevent them from attempting to bargain over academic issues and which prohibit strikes. William B. Gould IV, former chairman of the NLRB and current professor of law at Stanford, disagrees with this reasoning: “I don’t think that the idea that they’re appropriate at public as opposed to private makes any sense whatsoever.” He explains that when it comes to employment relationships, the Supreme Court has long ruled that private employers have management rights that are nonnegotiable. “The fact that there’s a union, that never means that every issue that the union may want to raise is bargainable,” he says. "Students, not workers." The idea has become like a slogan for the University over the course of its flight with graduate student unions. The relationship is one of student-teacher, not employee-employer, and the law does not, therefore, protect graduate students' right to collective bargaining. 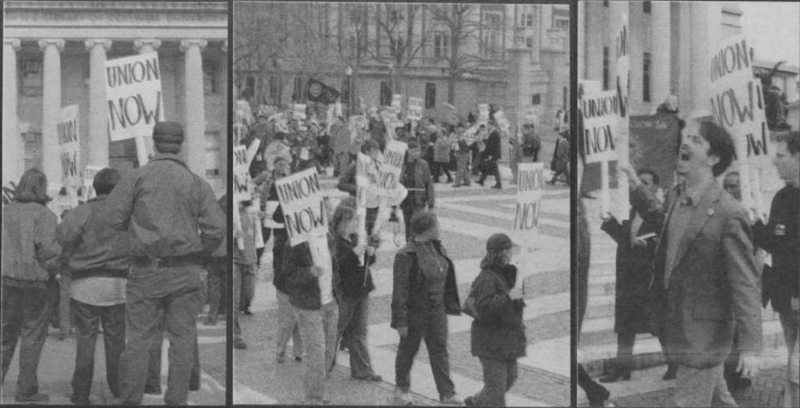 GSEU members march in front of Low Library in 2003. Carlos J. Alonso, dean of the Graduate School of Arts and Sciences, explains that the work graduate students are doing holds a different meaning than that of other unionized employees. It isn’t just a job, but “part of a consistent and well-developed system for forming intellectual teachers and researchers.” This sentiment is backed by the Office of the Provost’s website, which adds that the work is preparing them to find positions in academia. But casting such a broad stroke across a group as diverse and varied in interests and intellectual pursuits as the GWC can ignore the situations of a significant number of students. “The reality of it is that my teaching [has] almost nothing to do with my studies,” Paul Carpenter, a fourth-year film MFA student, told me when we first spoke last March. While Ph.D. programs at Columbia may lead naturally into faculty positions at universities—positions which inevitably require candidates to be skilled teachers or researchers—those in other programs often don’t seek a future in academia. Carpenter, for example, has a concentration in directing. The reality, for Carpenter and many other students in the film MFA program, is that teaching is seen as nothing more than a job. In fact, in the School of the Arts, which houses MFA programs in film, visual arts, theater, and writing, only 15.7 percent of the 2017 graduating class went on to teach in higher education. Department chairs in the School of the Arts pushed back against the characterization that TA positions don’t hold educational value. In an email, Hilary Brougher, chair and professor of the graduate film program, wrote that they view teaching as “integral” for their graduate students who seek careers in teaching or any sort of collaborative work. However, TAing is not a degree requirement within the School of the Arts, and students may choose to opt out of teaching positions. Matthew Buckingham, chair and professor of the visual arts program, tells me that in the past seven years, only one visual arts student has declined a TAship. Though Ph.D. programs may appear to lead more directly to careers in higher education and research, only 14.5 percent of the 2017 GSAS graduating class went on to teach in higher education, and only 7.8 percent found themselves in research positions. For those in SEAS, the numbers are even lower. Only 3.2 percent of the graduating class found themselves returning to teach at universities. Yet even those who do plan to enter academia feel that a union is well within their rights. Baublitz isn’t alone. Conversations with other graduate students paint a similar picture, one in which learning and working are not mutually exclusive acts. A picture in which they can, and should, coexist for the sake of those in need of better working conditions. Earlier in the plenary, Bollinger asserted, "We welcome unions as an institution." I mention this to Maida Rosenstein, president of the UAW Local 2110, as we chat in the small basement office that serves as the base for the UAW’s efforts at Columbia. The walls are covered in old photos from past fights. Worn-out photographs show members of the GSEU who have long since graduated from Columbia gathered in familiar places and carrying familiar signs. Collaged with more recent GWC photos, it’s not immediately clear which images are from the past and which are from the present. Sitting here in the UAW office, it’s impossible to ignore the history—not that Rosenstein seems like one to forget. In his 16 years as president of Columbia University, Bollinger has not met once with the UAW. “It wasn’t all smooth sailing,” Rosenstein says of the UAW’s relationship with the administration while Robert Kasdin was still senior executive vice president prior to stepping down in 2015, but at least there was some form of communication with the senior administration. Since then, she says, the relationship has only gotten worse. Despite the University’s claims that its opposition to unionization applies only to graduate students, it has demanded significant concessions in health care and tuition benefits for its unionized clerical staff, and has been cutting union-eligible positions for lower-level administrative officers who perform identical work, according to Rosenstein. The number of union-eligible clerical support staff positions at the University has gone from nearly 1200 in 1985 down to around 600 some 33 years later, she adds. 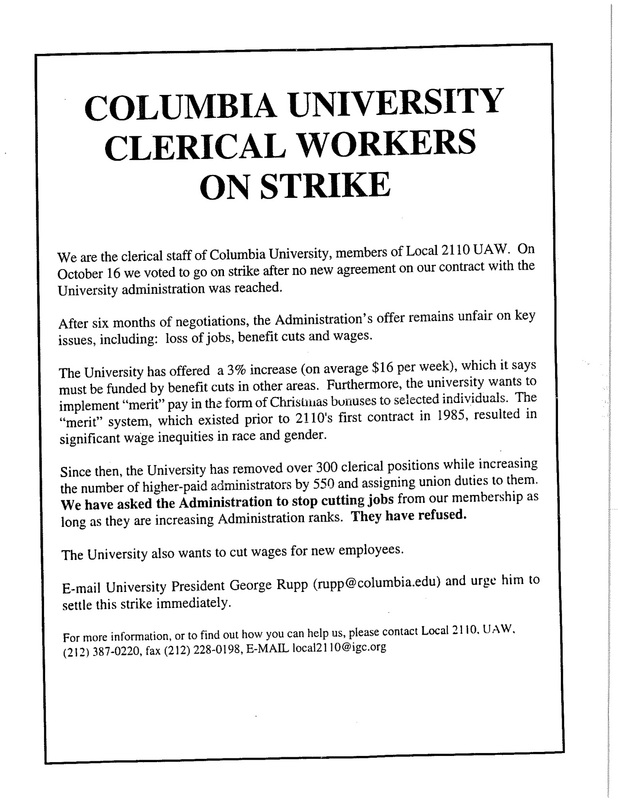 Leaflets put out by the UAW in 1997, before Bollinger assumed his role at Columbia, shows that these issues were not uncommon under Rupp. In these pages, the union decries the University administration for cutting 300 clerical positions over a 12 year period and for demanding concessions in wages and health benefits. 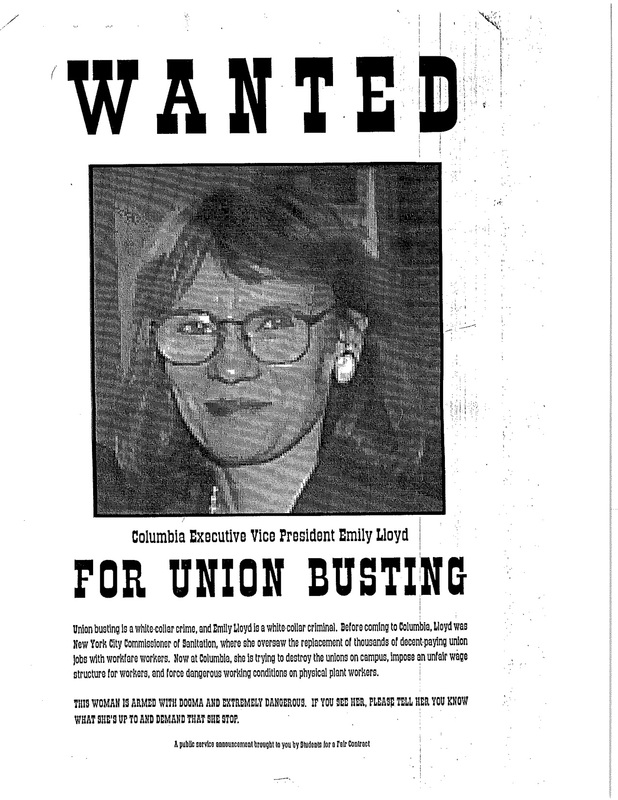 “Union busting is a white-collar crime, and Emily Lloyd is a white-collar criminal,” a 1997 pamphlet says of the EVP at the time. Still, Rosenstein says that the union has always had its disputes with the University, but feels especially disrespected by the long silence from Low Library. 1199 has faced similar issues. In the department of medicine at CUMC, the union says that the unit went from 42 union workers in April 2013 to just 17 in March of this year. These positions were replaced by nonunion workers. “I think Bollinger will have to define his definition of ‘welcoming unions,’” Ashby says. While the GWC may be the largest, most apparent union battle being waged on campus, 1199 has been working to settle a contract for eight health workers at Columbia at Columbia Primary Care. Ashby tells me that the union initially tried to fold these employees into one of their two existing contracts, then hold negotiations only over wages. The University, however, insisted on an entirely new contract, determined to revisit noneconomic topics such as sexual harassment and general grievance policies, which had already been effective in the two previous contracts. 1199 was able to negotiate and sign a contract for 400,000 employees in the League of Voluntary Hospitals and Homes within four months. For the eight health workers here at Columbia, negotiations have been ongoing for two years. Both GSEU and GWC began with a decision at NYU. For the former, it was the NLRB’s decision that allowed graduate student workers at private institutions the right to unionize. For the latter, it was NYU’s decision to voluntarily recognize its graduate student union, which showed that unionization for graduate students was possible even with the Brown decision in effect. The political climate that surrounded the rise and fall of the GSEU greatly resembles that of today. The NLRB held a liberal majority under President Bill Clinton and subsequently ruled in favor of NYU. However, with President George W. Bush, and a more conservative NLRB, the Brown decision reversed NYU’s previous ruling. The GWC NLRB victory was achieved again under a liberal majority brought about by President Obama. Given this historical back-and-forth in the courts—and now, the flip to a more conservative NLRB under the Trump administration—concerns have arisen regarding the possibility that the Columbia decision could be overturned. As universities attempt to fill more and more teaching positions with cheaper labor in the form of graduate students, adjuncts, part-timers, and a large number of other nontenured track faculty, the job prospects for Ph.D. students worsen. Graduate students become the cheaper labor that ultimately hurts the job market which they enter upon graduation. It’s a trend that spans the past 30 or 40 years, Lafer explains, “but it’s getting more and more desperate.” He believes this has strengthened support for unionization. 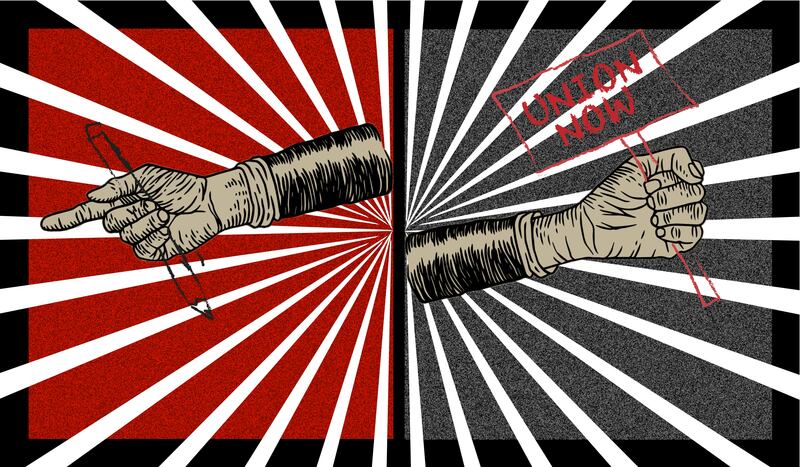 Unlike before, a number of private universities have willingly begun negotiations with their graduate student unions. These schools include Harvard, Brown, the New School, American University, Brandeis, Tufts, and others. Gould explains that the cause of this trend is twofold: First, to continue flipping back and forth on the issue each time the White House changes hands would be “unwieldy and chaotic” for the universities. Second, Gould believes that after over 40 years of collective bargaining at public universities, people are starting to realize that there’s nothing inherently harmful about it. Columbia, however, appears to have remained unchanged in its attitude since the time of the GSEU. 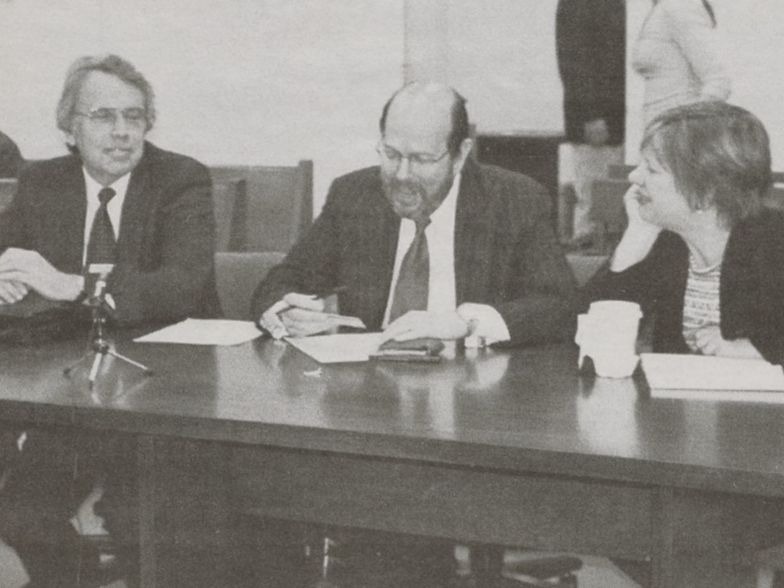 When the UAW chose to divert its attention toward saving the contract at NYU, it believed that, in the long run, it would help graduate students at Columbia. Eight years later, with the help of the Obama administration, they finally won their contract back. It’s been five years since that victory, and Columbia’s fate remains unclear. I ask her if she worries at all about the past repeating itself. The NLRB, the courts, and the Supreme Court, especially under the Trump administration, do pose a real concern, she admits. But in a fight like this, you can’t just win in the courts. The legal victories are great, but what do you do when the University refuses to accept them? Nationwide, graduate student union organizers at other private universities have also pulled out of the NLRB, choosing to find other means of pressuring their universities into coming to the table. It’s become clear to everyone that this fight must be won on campus rather than in court. This national effort reflects a departure from the time of the GSEU and perhaps a lesson learned by those organizing in higher education across the country. I ask Goldner how it feels to watch this fight from home nearly two decades after his began, and if, to him, the future of graduate student workers feels bright.